We have two supermarkets where you can get a good selection of groceries.Sample the finest local lamb and beef from the Butcher, and freshly baked bread from the Bakers. Drop by the Whisky Shop to make your selection from their extensive range of Scotland's most famous product. The Collector's Cabin is a treasure tove of collectables and you can hire a bike from the shop. 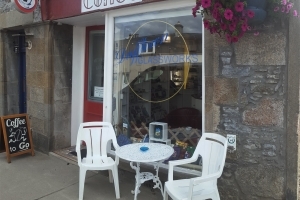 Browse some local art at the Still Life Studio in Aberlour - well worth a visit. Welcome to the Whisky Castle in Tomintoul. Sam and Scott and their team will provide a warm welcome and offer you a wonderful selection of unique whiskies to try. High Class Quality Family Butcher - Scottish Meat and Game at its best . A wide variety of home made sausages, haggis, black pudding and meat pies that will have you coming back to Dufftown again and again! Beautiful, Fresh Flowers and Gifts for every occasion are available at Rustic and Roses. Balvenie St. Ice Cream is a father & son team that offer more than 20 different flavour ice creams, including a choice of real Whisky Ice Creams. A MUST DO IN DUFFTOWN. 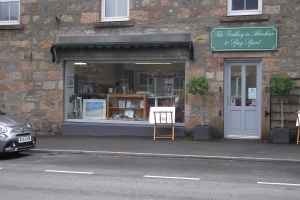 GALLERY FISHING TACKLE WOODTURNING CERAMICS WHISKY BARREL CRAFTS SCULPTURE TWEED BAGS SCARVES CARDS CANDLES PICTURE FRAMER WITH 25YRS EXPERIENCE FORMERLY STILL LIFE. A warm welcome awaits from Alison & Mark. Enjoy a fine selection of teas, coffee & cakes whilst browsing a range of handmade art and crafts. A real treasure trove of collectables. Feel free to pop in and just browse.